The content of this article provides interesting history, facts and information about the Armor of the Gladiators who fought in Roman arenas such as the Colosseum in Rome. The spectators loved a spectacle - costumes and different types of armor helped to provide this. Gladiators, and their style of combat, were instantly recognised by the Romans by the armor that they wore and the weapons that they carried. The pairing of gladiators in the arenas were important and ironically the Romans expected to see 'fair play' in the gladiatorial fights. Matched pairs of Roman gladiators of would ensure that one fighter was hampered by heavy armor whilst the other Gladiator had only minimal armor which allowed freedom of movement. 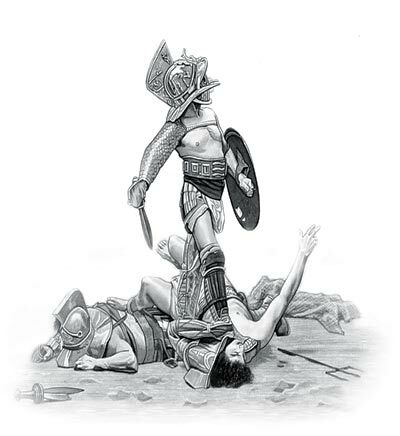 There were at least 26 different types of gladiator who specialised in using specific weapons, armor and shields. Shields were used not only as a protective element but also for pushing and attacking an opponent. Roman Gladiator Armor was there linked with the weapons that they used. Click Gladiator Weapons for facts and information. The following facts and information provides details of the Latin name used for the armor with a short description of each of the pieces of armor, together with useful information about the protective armor worn by different types of gladiators. The balteus was a sword belt. Cassis is a generic term for all helmets made of metal. The Galea was visored helmet worn by all gladiators except the retiarius. The Galea featured decorative crests and visors which were pierced with eyeholes. The Galerus was the distinctive metal shoulder guard of the gladiator referred to as the Retiarii or the Laquerarii. This shoulder piece was fashioned so that the neck and head were protected but the head movements of the Laquerarii or Retiarii were unrestricted. An ocrea was a metal leg guard, or greave, that ran from the knee, or sometimes the thigh, to below the shin protecting the front of the leg. A Parma was a small, light shield, usually round but occasionally square. It was made of metal or sometimes of wood (about 60 cms in diameter) and occasionally decorated with painted motifs. A Clipeus was a large, oval body-shield used by the equites who fought on horseback with a lance and then on foot with a sword. "tortoise"), in which Roman legionnaires surrounding themselves above and to the sides (like a tortoise shell). This sort of shield was carried by the gladiator called the murmillo. Bronze Face mask shaped to cover the face with eyslots, armor worn to protect the face. The Lorica squamata is a type of scale armour. The scales were wired together in horizontal rows that were then laced or sewn to the backing. The Spangenhelms were adapted from the original German design into highly protective conical Roman helmets curving with the shape of the head and culminating in a point. The helmet also hade large leather cheek guards, nasal bar, and deep neck guard however some helmets also included a full face mask. A Spongia was a small chest plate formed of a single piece of metal, or other rigid material, which covered the chest of the gladiator. A Cetratus was a light shield. The Cingulum was wide leather belt which was to protect the gladiators waistline from being injured. The Cingulum was often strengthened with metal plates. Legionary soldiers also wore cingulums which often had studded leather straps hanging from the front to protect the loin. A greave was a piece of armour that protected the leg. The content of this Roman Gladiator Armor category provides free educational details, facts and information for reference and research for schools, colleges and homework. Refer to the Colosseum Sitemap for a comprehensive search on interesting different categories containing the history, facts and information about Ancient Rome. Just like the subject of Roman Gladiator Armor there is hardly a page of Roman history and the Romans that is not, on some way, connected to the Roman Colosseum which became a symbol of Rome, its society, culture and life.